GQA External Quality Advisor Andy Carrington recently arranged a CPS event for some of the assessment team from MRG Services. The Essex based Centre delivers GQA qualification in Fenestration Installation, and during a recent site visit Andy and the business owner/Lead Assessor Jane Gunn discussed the Fabrication process. 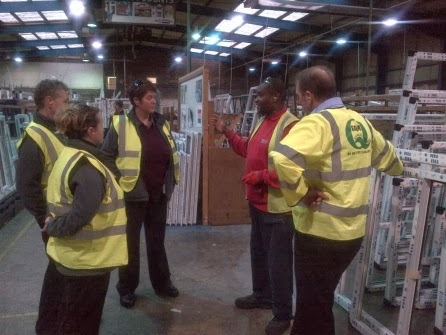 Jane felt that a CPD update on the processes used to fabricate the door and windows would benefit the assessment team and add even more value to their assessment processes and also help with plans the Centre has to deliver training and up skilling to those already in the Industry and those looking to get involved. Andy made contact with Consort Windows in Huthwaite, Nottinghamshire; an employer Andy had developed an excellent relationship with through qualification delivery while working at Derby College. Who were very happy to work with GQA on this and a full day’s CPD event was arranged. Jane along with 2 more Assessors from MRG, Mandy Reynolds and Karen Petch spent the day at Consort, with Sean Hayes from GQA attending also. The day started with Andy giving the delegates a presentation regarding the history of the Fabrication Industry and Consort Windows, this was followed by a full guided tour of the factory and the processes involved. Thanks to Andy’s great relationships with the staff, at Consort, individuals at every stage of the process were happy to explain in detail what they were doing and how this fitted in to the overall production process. Following the tour the delegate returned to the training room provided by Consort, where an assessment of the information given was carried out; all delegates achieved the pass mark. Andy said “the delegates from MRG are striving to improve their own knowledge and understanding of the industry. I am very confident their new knowledge will be passed on to their learners. This is a reflection on their professional approach to teaching and assessment”. Sean Hayes said “I have known Jane since MRG became an Approved Centre and it is typical of Jane’s commitment to quality that she took this opportunity for improving the knowledge of the team. 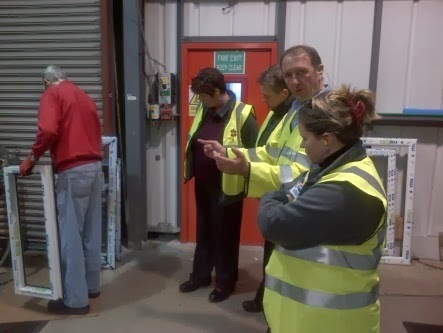 Consort Windows has a very successful business and continues to invest in its staff and equipment-it was good to see a number of GQA Certificates on display”. GQA would like to put on record their thanks to Consort Windows for hosting the event, in particular Daryl Lacey and Mark Bolton. GQA would also like to thank the team at MRG Services for taking such an active part in the day.